Thank The Simple Wasp For That Complex Glass Of Wine : The Salt Don't swat away that buzzing wasp. It may help spread the yeast that starts the fermentation process in grapes while they're still on the vine. The yeast carried by the wasp give wine its complexity, scientists say. The European hornet, or vespa crabro, helps make wine by kickstarting the fermentation process while the grapes are still on the vine. That's because those big scary flying insects whose stings can be especially painful may be the secret to the wonderful complex aroma and flavor of wine. "Wasps are indeed one of wine lovers' best friends," says Duccio Cavalieri, a professor of microbiology at the University of Florence in Italy. 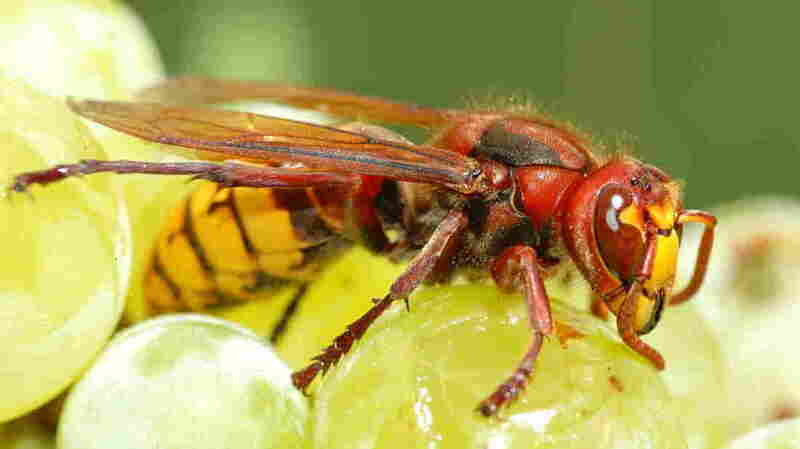 Cavalieri and his colleagues discovered that these hornets and wasps bite the grapes and help start the fermentation while grapes are still on the vines. They do that by spreading a yeast called Saccharomyces cerevisiae — commonly known as brewer's yeast and responsible for wine, beer and bread fermentation — in their guts. When the wasps bite into the fruit, they leave some of that yeast behind. Cavalieri says one of the reasons the discovery is so exciting for him is that it's an example of just how connected the natural world is and how humans rely on this interconnection in ways we simply cannot perceive. "It's important because it's telling to me it's crucial to look at conservation and the study of biodiversity," says Cavalieri, one of the authors who published his findings in the journal Proceedings of the National Academy of Sciences recently. "Everything is linked," he adds. Of course, Cavalieri says, winemakers can add yeast later. But wines would not taste the same without wasps. Different yeasts applied at different times have a big impact on flavors. The wasps also introduce other microorganisms to the grapes, which add flavors to the wine. "One of the most beautiful things of wine is the fact that basically it's complex; it's made of several parts and it communicates to several parts of your brain," he says, which could be lost without the wasps and hornets. Cavalieri comes by his interest in wine naturally. He's from a family of winemakers in the Chianti region of Italy. He first had the inkling of hornets' special role when he saw them piercing the skin of grapes during field research in the region 15 years ago. Insects have long helped out with wine and other crops, we just didn't know why. At least since the time of the ancient Romans, winemakers have planted flowers near their vines to lure certain insects. The researchers were able to unwrap the mystery of the insects' role by using DNA sequencing techniques to analyze the genes of the yeast, then tracing them to the guts of wasps. They even did a lab experiment to see if hornets could pass the yeast to their offspring, and they did. Other insects and birds also carry the yeast, Cavalieri says.But hornets seem to play a special role because they both harbor the yeast over winters and can pass them along to their offspring. You can imagine a vineyard might be interested in pest control — but perhaps it should be careful about which bugs it considers pests. Evolutionary biologist Anne Pringle of Harvard, who was not involved in the study, says the findings have two strong messages: Great wines need bugs and people still know almost nothing about ecology. "If you'd like to have your grapes fermented by local yeasts, which I think many vineyards do, then you have to have these insects around," she says.